No, this is not a Skid Row reference. Supposedly, the fact that most of these "youths" are Muslims from poor neighborhood is irrelevant to Reuters. The good news is that 1,137 cars being torched is 10 less than how many were torched last year! Mazel tov, Islamic French youth! Youths burned 1,137 cars across France overnight as New Year’s Eve celebrations once again turned violent, the French Interior Ministry said on Friday. 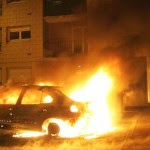 Car burnings are regular occurrences in poor suburbs that ring France’s big cities, but the arson is especially prevalent during New Year’s Eve revelry. The number of vehicles torched was only 10 short of the record 1,147 burned this time last year, even though the Interior Ministry mobilized 45,000 police during the night — 10,000 more than 12 months ago. It said police detained 549 people overnight, compared with 288 in 2009 New Year celebrations. However, unlike in previous years, there were no direct clashes between police and youths. “The few disturbances that did take place were brought swiftly under control,” the ministry said in a statement. The vandalism is generally attributed to marauding youths from tough neighborhoods in immigrant-heavy areas, and evokes the three-week wave of riots and other violence that shocked the country in late 2005.